Like most of us, I shot film until digital came along, and then my backpack of expensive German glass languished in the cupboard for years. That lasted until five years ago, when I bought a 1920 Kodak for $10 on eBay and ran my first roll of film through it. Although light leaks and bad exposures plagued most of the frames, one image of an antique gas station was excellent, with pleasing color and subtle tonal gradation. I was hooked. I realized for the first time that equipment from the early part of the century could produce striking, professional-quality images. Better yet, I achieved beautiful results with both black and white and color film. As a result, most of my work is now done with my collection of cameras made between 1900 and 1930. They don’t just sit in their display cabinets, either. My cameras, the result of many hours of patient restoration, are old and beautiful, but they’re like sled dogs- they work for a living. 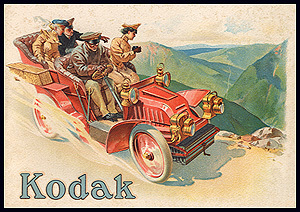 I prowl eBay for old Kodaks from the 1900s and 1920s. They have black leather bellows that pull out, and lenses named “Rapid Rectilinear”, “Anastigmat”, and “Tessar”. Many of these old lenses yield photos with a lovely “feel” unlike those from modern, mathematically perfect lenses. Bodies are covered with rich leather, and metal parts gleam with chrome or burnished brass. No flash- indoor pictures were taken by setting up the camera, turning out the lights, holding up a piece of “flash paper”, and lighting it with a match while your subjects held their smiles in the dark! 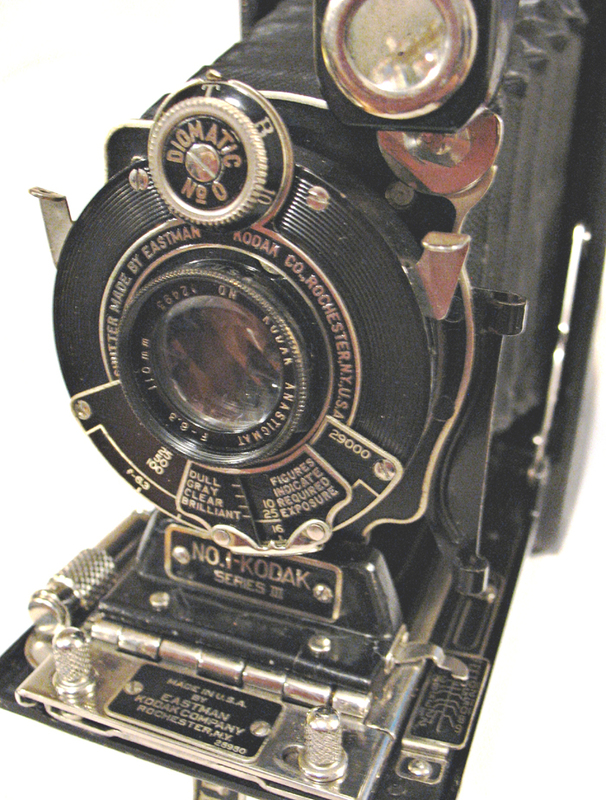 My present camera is a 1914 No.1 Kodak Junior, the “No. 1” indicating that it takes 120 film. In an era when enlargers were unknown and roll film came in sizes up to five inches wide, this was the miniature camera of its day. It has two shutter speeds, 1/25 and 1/50, together with T and B. F-stops are marked in the old U.S. system with 4, 8, 16, 32 and 64 equaling modern f-stops of 8, 11, 16, 22, and 45. The lens is an uncoated Rapid Rectilinear. 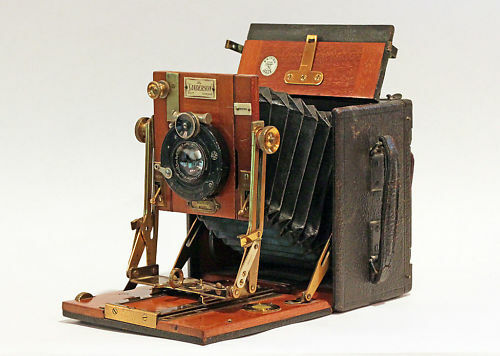 Designed in the late 1800s, it nevertheless rewards me with razor-sharp images. If I want to be “modern”, I pull out my lovely, near-new 1928 No.1 Kodak with its four shutter speeds and crisp f/6.3 105mm Anastigmat lens for a days’ outing in search of old barns and farmhouses. Image processing is by a hybrid approach combining the best features of film and digital. My film is typically Ilford XP-2 for black and white or Kodak VC-160 for color. Both have fine grain and generous exposure latitude. Using film lets me record a tonal range of approximately seven stops, compared to the six-stop range usual with a digital chip. The negatives are then scanned, allowing me the full creativity and flexibility of processing in Photoshop. There are challenges, however. I puzzled over streaks ruining my night photos until I remembered shining my flashlight into the film counter window to read the numbers on the film. I quickly bought a red flashlight for winding the film in the dark. Old bellows often leak light through pinholes at the corners. I finally found a liquid plastic used to coat screwdriver handles that sealed the tiny holes but remained flexible and didn’t crack. These old relics are not simple to use; the older the camera, the more ways there seems to be to mess up a picture. Why I persist in this particular form of insanity is anybody’s guess, but it is habit-forming. One might think of this affectation as the photographic equivalent of bow hunting, where one maximizes one’s frustration and discomfort, and gives the prey every possible chance to slip away. However, I suspect that my affection (frequently unrequited) for the look and feel of brass lenses and old camera leather is probably incurable. The results are worth it. I cherish the lovely tonal qualities of a marsh in the afternoon light, or the patterns of Palouse wheat fields after harvest. I love night photography, stalking old churchyards to capture the eerie mood of my shadow projected among eroded tombstones, or pondering the image of a floodlit Spanish mission. I always marvel at the rich color from a lens created forty years before color film appeared on the shelves. The cameras are old, but they keep me young. I’m an inveterate explorer, and am always looking for an old barn, an abandoned car, or a group of gnarled trees to capture as images in my beloved antiques. With luck, I will be wandering the back roads with my beloved relics for many years to come. I began this site to share with others the wonderful rewards that I have gained from working with these old masterworks of brass, glass and leather. Not just the pleasure of owning or collecting them, but of actually using them and seeing the wonderful images that they can produce. I hope to share with you what I have learned about finding usable old cameras, some tips on cleaning and restoring them, and what I have discovered about using them. In between, I may add some thoughts on the creative process and a few stories about my adventures as an itinerant fine art photographer with a funny-looking camera. I hope that you find even a fraction of the rich pleasure that I’ve gained from these wonderful old machines. More than just the cameras and the images, this blog is about the adventures that I have had and the people that I have met. Owning and using a vintage camera is more than just about finding memorable images – wherever I work, on a sunset seashore or on the busy streets of Seattle, people come up to me an ask me about my cameras. Older folks smile and say, “I had one just like that”, remembering snapshots of a special occasion. Young people may never have seen a film camera before, and you can see their wonder as they peer though the viewfinder and follow the intricate folding linkages between their finger and the shutter. They are not just fine old cameras; for a brief moment, they allow lives to touch, and while you give something, you come away with so much more. Remember as you read that this site is a living organism, constantly growing and changing. Rather than waiting until posts are in their final, polished form, I have published many of my longer, technical posts as works in progress, sharing their growth with my readers as my own thoughts, discoveries, and learning processes evolve. Overall, I have tried to keep the blog in a format of informative,technically-oriented articles separated by images and discussions of the creative process involved in each image. Eventually, the blog format may evolve into a more formal web site. Note- This posting appeared in modified form in the Fall 2009 issue of Canadian Camera magazine. This entry was posted in Introduction by randcollins. Bookmark the permalink. Dr. Collins, I ran across your blog reference on the IDCC and as a reluctant repository for aged, turn-of-the-century, family Kodak’s, I am now looking at them with a new found interest. I find your information is for the user and at a level which is enjoyable to read and explore. I look forward to bidding against you on eBay. Thanks! Thanks, Engle. Good luck with the Kodaks. If I can be of any help, my direct e-mail is randcollins6@yahoo.com. In the near future, I plan to start writing about restoring old cameras. Nice site. A few comments may be in order. First, enlargers date back to the dry plate era, 1870s. Kodak made miniature cameras in the early 1890s ( the pocket Kodak, film size 1 1/2 x 2 inches ) and the vest pocket kodak was introduced in 1912 for film 1 5/8 x 2 1/8. Both of these cameras had enlarging cameras of the same name for making large prints from their small negatives. The Bulls-eye enlarging camera of 1898 and later made up to 6 x 8 enlargments from 2 1 /4 x 3 1/4 inch negatives. In 1914 and earlier there were also Brownie enlarging cameras. So, enlargers were not unknown and the 120 cameras were not the miniature cameras, or even Kodaks of that era. Finally, your picturer of an 1898 # 5 Folding Cartridge Kodak is really a pre-1892 #5 Folding Kodak Camera ( used a roll holder ). information that you include make it a fascinating read. camera in 7th grade, an ancient 4 x 5″ with only 2 cut film holders. also, but have yet to run any film through it. reading on your site and it got me fired up. work, keep on with it. Thanks so much for the nice comment. What would you like to see included specifically? I’m not sure why this post from 2009 showed up in my feed reader just today (10/29/10) but I’m glad it did. I’ve subscribed for some time now and enjoy your posts. I didn’t really start to enjoy photography until I got my first digital camera a few years ago, but I’ve loved old cameras since I was a boy. My collection today focuses on folders and rangefinder/viewfinder 35mm. My favorite camera is my Canonet QL17 G-III, but I just ran a roll of Plus X through my 1930s art deco Kodak Six-20 and am waiting to hear that the processing is complete. I’m glad for the tip about the Ilford XP-2, I’ll try it next time I use one of my old folders! Like you, I’m a bit of an explorer at heart, and enjoy taking one of my old cameras out and about to see what I can find to photograph. Here’s a post on my blog about an a 1950s viewfinder 35mm I recently shot: http://jimgrey.wordpress.com/2010/06/07/argus-a-four/. Thank you for your message and comments. I, in turn, admire your involvement with vintage cameras. The intricacies and complexities of operating older cameras are such that I raise my hat to you…and at your patience. but I suspect that the results are enormously satisfying. Message*: A very impressive site. I have been authoring the blog “Through a Vintage Lens” for two years now, and have just moved it to its own hosted site at http://www.throughavintagelens.com. I have much to learn, and your site is an inspiration. I deal with fine art photography with vintage cameras – just entered an exhibit with a lovely image I took with a 1914 Kodak with a Rapid Rectilinear lens. Thanks for hosting this site; I have subscribed. I was happy to find a fine blog from Canada — I’m in Calgary — about the kind of photography (and cameras) that interest me. As a senior citizen (old fart) I haven’t gone digital in part because of the cost, and because my 30+ year-old film cameras can do anything I want them to do. I’m no collector, and I use my vintage cameras because I like the effects they produce. When eBay came around, I was able to buy some older cameras that I always wanted when I was a boy. My favorites are the Graflex products, and I now have 3×4 (1931) and 2×3 Graflex SLRs and 4×5 and 2×3 Graphics (last three all from 1947). The 3×4 Graflex with 162mm lens and a 2×3 rollfilm holder is a wonderful portrait camera. I’m now training myself to use a late-1940s Ansco 8×10 in wonderful shape; 8×10 takes a bit of learning, but there’s nothing like an 8×10 contact print. There used to be two good technicians in Calgary that worked on mechanical cameras, but unfortunately (and understandably) they have quit the business. Working on shutters is beyond me. Best wishes and I’ll be following your blog with interest. Thank you for your lovely comment. It truly makes the writing worthwhile. When I finish all of the tweaks to the new hosted site, I will return to complete older articles and start some new topics. Any topics that you would like to see?